After complete rest and rainy night we woke up to find a perfect morning in Madurai. Breakfast at the hotel was quite elaborate and we did a good one before starting for Rameshwaram. The hotel guys were kind enough to give us elaborate maps which really helped us to exit Madurai without asking for any direction. One thing we noticed in Tamil-Nadu the direction boards are mostly in Tamil and less of English compared to Karnataka. 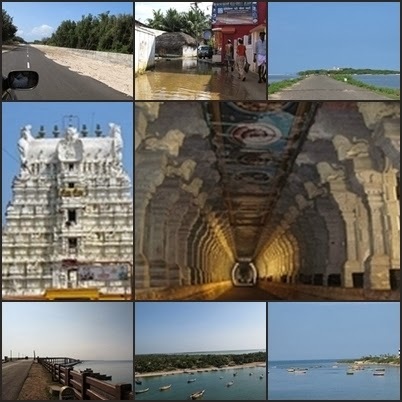 The distance between Madurai and Rameshwaram is around 170 KM. The road is mostly undivided 2 lane Indian highway. There are few patch of the road which has pot holes otherwise the road is in good condition. The general scenery was very green and the key factor Vaigai river flows along the highway NH49.While going we did not stopped and directly reached Ramanathaswamy Temple. We crossed the unique Pamban Bridge and left photo shot for our return. We had to pay around 30 INR as entry fee for Rameshraam. As soon as we entered the temple we were approached by a guide who was fluent with Hindi and agreed for a mutual price. He guided through many kunds ( holy water – hole) where we had to wash our head. There is a catch 22 situation you might get drenched in the water but when you enter the temple to pray you must be in dry cloth. We literally dashed through the huge complex and this guide used all kind of tricks like pushing, back door entry to ensure we get the a good glimpse of the dieties with minimal wait. It was good to have him otherwise it would have taken us long time to go around. The walkway is always moist while hallways are dark so be careful with your steps. I was bitten by some insect badly on one of my foot. After temple visit we went to Dhanushkodi to see the beach; drive was worth. From there you can see Sri-Lanka’s shore line. The beach was not very clean and more over it was hot noon so returned back quickly.One of the attraction of Rameshwaram is Abdul Kalam’s house. But it was very sad to say the approach road was full of knee-deep water and it felt like driving over sewage water to reach the great man’s birth place. Definitely Rameshraam city council needs to spend some money to make this ex-house of the great Indian a true attraction.At 3.30 pm after lunch when we started back towards Madurai. We stopped at Pamban Bridge for some photo shoot. This is the first sea bridge in India connecting Rameshwaram and mainland India built by British in 1914. Mid way we encountered a big torrential Northeast Monsoon. It was almost 6:30 in the evening when we reached the outskirts of Madurai. We had two options either to stay back in Madurai for the night or drive down to Kanayakumari. After calling friends and gaining confidence on the road condition we opted for the second one. The NH-7 between Madurai and Kanayakumari was very new which meant even though it is a 4 lane divided highway the toll collection has not started yet. That had one major draw back as you need to be extra vigilant as road marks were also not proper. We stopped for refueling (near Tiruneveli exit) and stretched our legs. At the end the main highway goes towards Kerala and we needed to take an turn which we missed and had to make an U-turn after missing it for the first time. It was 11 in the night when we reached Kanyakumari . We settled for hotel Samudra, the room was very basic but we were OK and did not had any energy left to find a better place. The best part of this hotel is it was just adjacent to sea where you can hear the sound of waves. Indeed it was a long driving day with almost 600 KM from the morning. Thanks for sharing!! Nice Blog!